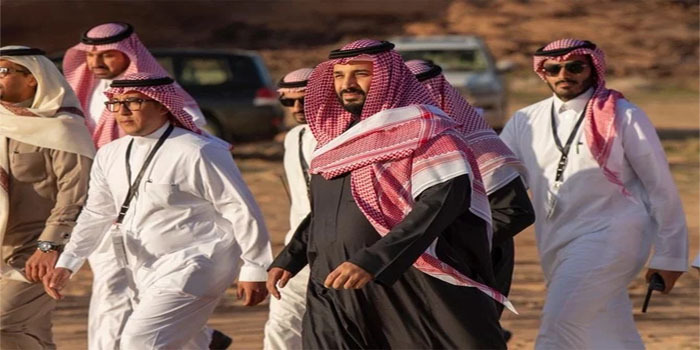 Saudi Arabia’s Crown Prince Mohammed bin Salman launched on Sunday mega tourism projects in Al-Ula, including a resort designed by a renowned French architect and a nature reserve, both called Sharaan. The plan for sustainable development of the region, which includes the Sharaan Resort inside a designated nature reserve, was launched by Crown Prince Mohammed bin Salman and the governor of the Royal Commission for Al-Ula, Prince Badr bin Abdullah bin Farhan, at a groundbreaking ceremony at the Maraya theater. The mirrored concert hall was built for the Winter at Tantora festival, which has brought visitors to the untouched area every weekend since December, giving them a taste of what’s to come. Several hundred guests were welcomed in the concert hall, including Prince Abdul Aziz bin Turki Al-Faisal, Princess Reema bint Bandar and Yanni, who performed at the Winter at Tantora festival last weekend. “This is just so beautiful, the desert and the sky at night, the stars… the natural beauty here is stunning,” Yanni told Arab News. “I have never experienced this type of beauty before in my life.”The charter for Al-Ula was presented on a stage made of sand, with a multimedia sound and light show involving local men and women, the “guardians” of Al-Ula. The rocks of Al-Ula, visible through glass at the back of the stage, served as a backdrop. There is already a link between Nouvel and Al-Ula: A number of ancient treasures from the area are now on display as part of the Roads of Arabia exhibit in Louvre Abu Dhabi. But the Sharaan Resort is a link that is even closer to home. The resort will include residential estates, a summit center, a spa and restaurants. The full design will be completed by the end of this year; construction is expected to begin in early 2020, with a completion date of 2023. The commission aims, by 2035, to attract 2 million visitors to the area, creating 38,000 jobs and generating SR120 billion ($32 billion). The commission has already launched a scholarship program to train Saudi students in the US, the UK and France in the fields of tourism and archaeology; this year, it will add architecture and environmental planning to the mix. The Hammayah program will also provide up to 2,500 opportunities for local men and women to get involved in a community effort to preserve the wonders of Al-Ula.